Breast cancer research has led to the identification of two genes that, when functioning properly, regulate cellular growth and prevent the runaway metastasis of mammary tissue which leads to breast tumors and ultimately cancer. These genes are, with typical scientific economy, called BRCA1 and BRCA2. Because of the unusually repetitive nature of these genes, speculation that they function as "regulator" genes seems well-founded, and the link between abnormalities in these genes and breast cancer has already been established. The mystifying part is understanding why these genes malfunction, and if so, what can be done about it to prevent at-risk or genetically predisposed women from developing breast cancer. One question researchers at Oxford pose is why these genes, which seem to be universally expressed, seem to be so intrinsically tied to breast and ovarian cancer? Cancer researchers believe that finding the answer to this question may lead to new, non-invasive therapies and perhaps even prophylactic treatments for women whose genetic code reveals a predisposition toward these types of cancers. If they can work out how the breakdown of these genes relates to specific types of cancer, the ramifications for diagnosis and treatment of other forms of cancer are potentially unlimited. A second question is whether the "masking" of these gene expression in the human body may be a contributing factor in leading to cancer, or if genetic derangement or disarray might be the culprit. Until the mechanisms by which these genes govern cellular development are understood, this remains the more daunting question, as it is the basis for everything discussed in the first. Without a clear understanding of how these genes regulate cellular activity and what specific mutations or anomalies within them cause them to cease working properly, a solution to the myriad riddles cancer poses becomes impractical at best and science fiction at worst. 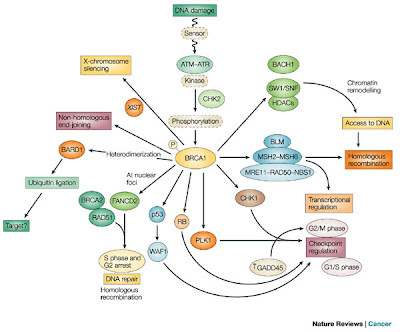 What is known about BRCA1 and BRCA2 is that the anomalous functions, also known as mutations, which appear to be the proximal cause of breast and ovarian cancer are hereditary. Both of these genes, when present in their mutated states in women who are susceptible to breast cancer as a result of heredity, give a lifetime risk of breast cancer approaching eighty percent. The difference is that in BRCA1-mutated women, the disease appears to have an earlier lifetime onset than in BRCA2-mutated women. It should be borne in mind that males also carry these genes, and male breast cancer, while rarer than female breast cancer, is still certainly possible. In males carrying mutated BRCA1 genes, the risk of prostate cancer appears to be vastly elevated, whereas the BRCA2 gene can be at least theoretically linked to pancreatic, prostate or ovarian, stomach, and skin cancer in both men and women. By understanding the mechanics and mechanisms of these genes, how they express themselves in regulating cellular growth, and what mechanisms cause them to stop working, it is entirely possible that these two genes may help us unlock the secret of one of modern man's greatest threats to life and longevity. In laboratory experiments, scientists have determined that BRCA1 plays a critical role in repairing damage to double-strand DNA at the sub-genomic level, beginning to interact with and repair the damaged portions of the DNA within minutes of the initial damage. This makes BRCA1 first on the scene by a matter of hours before other proteins and genes begin their own work. Scientists theorize this cellular healing mechanism works by altering the chromatin structure of the cellular nucleus to allow other repair proteins into the nucleotides. While this exciting discovery is not a cure in itself, it does offer hope that we are finally making strides toward understanding the role that BRCA1 and BRCA2 play in hereditary cancer and perhaps finding new ways of treating various cancers. Since the roles of BRCA1 and BRCA2 in cellular healing are so evident, it stands to reason that these genes may lack an "off switch" in their mutated form. By studying and understanding the mechanics of these genes, it is possible we will be able to determine how to both predict and preempt the onslaught of numerous types of cancer. If so, this discovery offers hope we might finally eradicate cancer altogether. The p53 and Mdm2 relationship is one of the most researched areas of signaling and has taught scientists many important signaling concepts. p53 is a specific transcription factor that functions as a tumor suppressor and causes damage to DNA. When there is no stress or DNA damage, p53 activity is not activated. When stress affects the body in some way, the p53 protein is activated due to phosphorylation. Depending on the stress or DNA damage, the p53 protein can activate a variety of genes that have the potential to cause inhibition of cell growth, DNA repair, apoptosis, or changes in cell differentiation. The phosphorylation of p53 is quite complex and varies in the progression of the cell cycle of normal growing cells. This complexity affects its ability to associate with its regulatory proteins, such as Mdm2. The variety of p53 phosphorylation can be seen when one analyzes signaling in tumors. p53 phosphorylation is different in tumors and an increase in the degree of phosphorylation can be seen, as compared to normal cells and tissues. This increase in p53 phosphorylation indicates a failure of the p53 phosphatases to stop signaling. Additionally, approximately 50% of all tumor types carry a p53 mutation. These mutations are typically seen in the DNA binding domain, which affects transcriptional activity and its overall cellular activities. The elevated expression of p53 leads to greater stability, which also induces the regulatory protein Mdm2. Mdm2 is a proto-oncogene that is amplified in approximately 7% of cancers and is frequently seen in soft tissue tumors. A proto-oncogene is a gene that becomes an oncogene, a gene that has the potential to cause cancer, through mutations or an increase in expression. The combination of a p53 mutation with overexpression of Mdm2 results in a worse prognosis for a patient, as compared to a patient with only the mutation or the overexpression. Mdm2 protein has the activity of an ubiquitin ligase, which allows for the targeted degradation of its substrates, including p53. In addition to marking p53 for degradation, Mdm2 also binds to p53 and transports it out of the nucleus into the cytoplasm for degradation. The phosphorylation of p53 affects Mdm2’s ability to target p53 for degradation. When stress or DNA damage occurs in the body and the phosphorylation of p53 occurs on multiple sites, Mdm2 does not associate with p53. Researchers have recently discovered Mdm2 in human tumors and these scientists hypothesize that Mdm2 plays a role in tumorigenesis, with or without p53. The relationship between p53 and Mdm2 has been shown to be vital to the normal functioning of the human cell, and also has other implications in cancer. Additionally, scientists have found that this relationship is an important part of a number of complex cellular signaling cascade pathways, including Ras, β-catenin, myc, Rb, and many more. The complexity of the p53-Mdm2 link illustrates the importance of this signaling pathway and indicates it is a viable therapeutic target. Researchers are studying this signaling relationship in order to design targeted drugs and therapies for cancer, as well as many other diseases. Prostate cancer is a serious medical issue in men; this type of cancer is the second deadliest type of cancer and the most frequently diagnosed cancer in males. Scientists have suspected that chemokines are involved in prostate cancer progression, and are now being researched extensively. Chemokines are a type of cytokines that are involved in inflammation and stimulate chemotaxis, also known as movement, of leukocytes, a type of white blood cells. There are 45 types of chemokines in the human body and they interact with a type of receptor known as a G protein coupled receptor. Many of these chemokines are redundant; multiple chemokines interact with one receptor or multiple receptors interact with one chemokine. 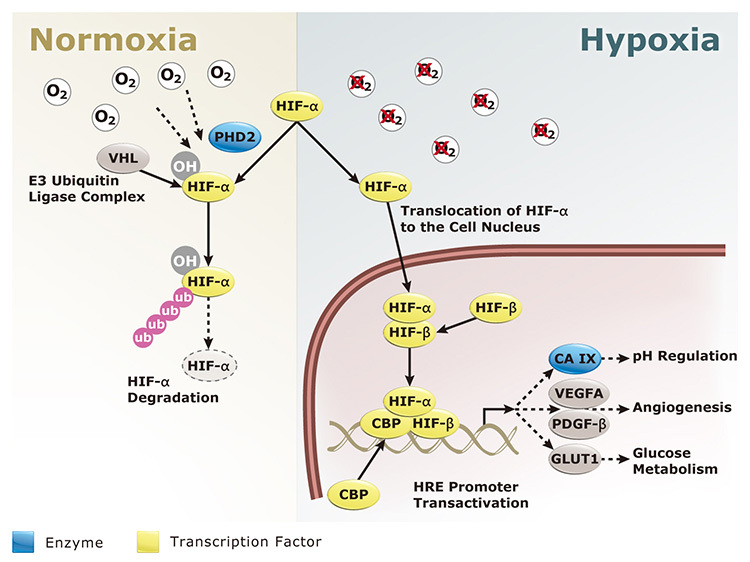 After the chemokines interact with a receptor, the receptor induces a signaling cascade that can control a number of different responses in the body. Researchers believe the chemokines play a role in prostate cancer because research has shown that the expression of chemokines changes when the prostate changes from normal to benign prostatic hyperplasia (BPH) and finally, to prostate cancer itself. Most of the research being conducted on chemokines has been on CXCL8, CXCL12, and CCL2. Recent studies have shown that CXCL8 levels are higher in patients with BPH than in patients with a normal prostate. Additionally, the CXCL8 RNA levels increased in patients with an increased severity of prostate tumors. In patients with recurring prostate cancer, CXCL8 has been found in benign areas near the cancerous tumors, but it has not been found in benign areas in patients without cancer recurrence. The chemokine, CXCL12, and its receptor, CXCR4, have also exhibited correlations with prostate cancer. Both CXCL12 and CXCR4 were higher in patients’ tissue with prostate cancer compared to patients’ tissue with BPH. Also, patients with a higher number of CXCR4 receptors expressed in tumors demonstrated a lower survival expectation than patients with a lower number of receptors. In addition to affecting the cancer itself, chemokines have an impact on the incidence of prostate cancer. African American men with prostate cancer have higher levels of CCL5, CCRT, and CXCR4 in their cancerous tumors, as compared to European American men with prostate cancer. Correspondingly, African American men have a higher incidence of prostate overall, as compared to other male racial populations. As physicians and many patients are aware of, age also plays a important factor in the development of prostate cancer. Older prostate stromal fibroblasts, common cells present in all patients’ prostates, exhibit higher levels of CXCLR, when compared to younger prostate fibroblasts. While there still remains much research to be done, scientists now know that chemokines are involved somehow in the progression of . 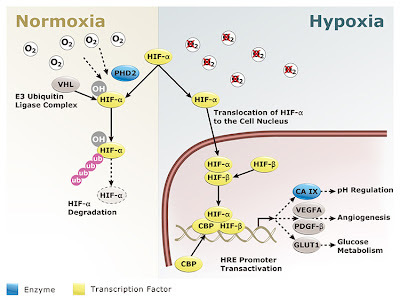 These chemokines and their receptors regulate the invasion and infiltration of cells, such leukocytes, and the growth of cancerous cells and blood vessels. However, the actual signals and regulation of the chemokines in prostate cancer are not well understood. Additionally, not all of the chemokines have been studied in prostate cancer, and many chemokines are most likely involved in the disease progression. Based on the existing research, it is clear that these chemokines exist as prostate cancer markers and may serve as potential therapeutic targets for cancer treatments.